This was made over a cumulative time of about 5 or 6 hours as my weekend turned out to be much busier than anticipated when I signed up to the jam. I didn't get why it's called 1291. Then I googled "1291" and realized that the xkcd comic this is based on is #1291. Odd title, doesn't really fit, but alright. 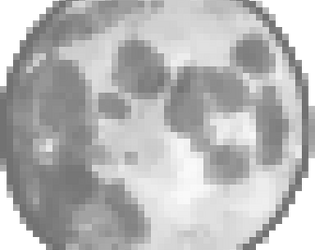 It's basically a dream come true for the person in the comic: we get to shoot the moon at last. C:< But the moon is fighting back with meteors, and we die in one hit. We must kill the moon before it kills us. . . I'm really not a fan of the fact that we can't fully move around the screen in this game. I guess it makes sense, but I still feel restricted by W and S. Also the shooting in this game feels very slow and, with that slowness, tedious. The worst thing about this game is that it basically amounts to holding down the J key and not moving AT ALL while the moon shoots projectiles in vain, because the center meteor will always hit your bullets. It makes the game quite boring and amounts to no strategy at all. And when the moon is destroyed, there's no "you did it!" or anything, you just stand there. Overall, this was a rather bland shooter. I'd love to see a full version of this, because it's a fun concept for a game. But I didn't really enjoy that I played here. From what you've said on your blog, an expanded version does seem to be in development, so I'll look forward to it whenever it comes out. There are three reasons as to why I called it 1291. The first reason, as you already figured out, is because the inspiration is comic 1291. 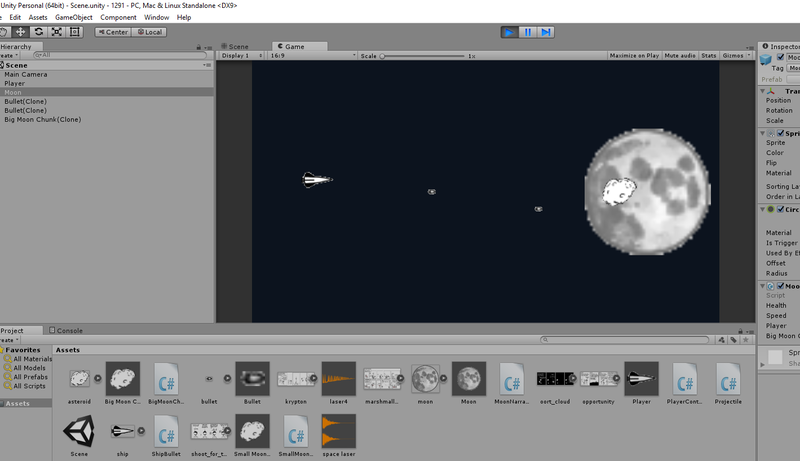 The second is there was a demo game that came with Game Maker 6 (the first "engine" I ever started messing with making games on) called 1945 that was a side-scrolling shooter. The third is that the only other option I could think of in the time was just calling it "Shoot the Moon", which honestly might be a better title as it does what it says on the tin. Just getting vertical movement to work nicely together was a big hassle for me. As I have mention several times before, this entry was made in 5 hours, and it had been over a year since I had last used Unity. To add horizontal movement to the mix as well would have taken more time than I had, but it will probably be added. That said, I have been idly thinking of other was to do the horizontal movement, without actually moving the character. Mainly, slowing and speeding projectile's horizontal speed by pressing back or forward. The shooting might feel less tedious if there were more things to shoot, but thank you for the feedback. I might not change the speeds as they are at the moment, but instead introduce difficulty settings and part of the increased difficulties is an increased speed modifier. You're quite right. At the moment, it is a very boring game. I knew I didn't have the time on my hands to create an full game or even the full boss. Maybe if I had the full weekend, maybe. So my goal was to make it as mechanically complete as I could in the time I had. As such, you can move, shoot, damage things you shoot, kill the moon, get hit, get killed. At a very basic, fundamental level that is everything you can do in the game. All the variations on how you do it is additional content rather than additional features. And good to know about the art assets. That said, I would like to either make, or talk to some art-y friends about making, assets specifically for the game. As is apparent up-scaling snippets from the comic does make a high quality sprite. Thanks for the rating :) I'll be sure to keep an eye out for the review vid. Yeah, I had waayyy bigger ambitions for this game than I ended up being able to fulfill. Between working on getting my car running, longstanding weekend commitments, one friend having a 21st and another having a "I'm going inter-state and you probably won't hear much from me in that time so let's get everyone together for a party before I go", and a job coming up like the weekend before the jam, I ended up getting like 5 or 6 hours of work done in total. I do intend to continue working on the game though to try and realise some of those ambitions and ideas. Progress will be posted on my blog at rainbowserpentlabs.wordpress.com, where I tried to make posts on stay on top of the jam but between only a little progress and general busy-ness, there was not much to write about and even that was delayed. If you are interested in reviewing it and its design when I have a more complete game I would be happy to get in touch and get it to you. cool followed looking to see what you can make! Though I probably will spend some downtime, either there or on the flights or maybe both with a pen and notepad and noodle with some ideas, mechanics and maybe designs.